You know that TV spots are a tried and true way of growing viewership for your shows, but one simple mistake in traffic can ruin the best-laid plans. This leaves your spot in limbo until the issue can be addressed or, more often than not, falls through the cracks. Say goodbye to your well-thought-out marketing plans, selective media buys and multiple versions of creative. It’s all for nothing if the spot doesn’t make it to your audience. 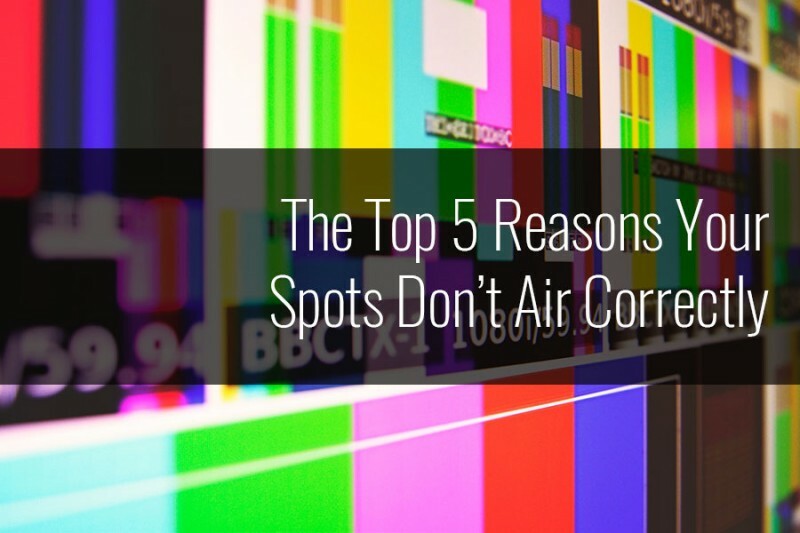 But, what causes a spot to go unaired or air incorrectly? Most of the time, there is nothing you can do about close ISCIs. Mistakes happen, we understand. When someone is bogged down with dozens of file numbers, one wrong digit can seem like an acceptable loss ratio. Every station has its own clearance guidelines, and 0.2 seconds can cost you your spot, or worse, an entire marketplace. But having different versions of an ad is necessary for creativity, network clearance and station or regional requirements. Keeping them all straight is a constant challenge! “Just read the traffic instructions!” It seems so simple, but we all have had to say this at some point. You put a whole strategy behind a buy, but what’s the use when your rotation is up for grabs. Those Tide Super Bowl ads? Imagine watching one of the surreal 15-second versions first before the 45-second spot airs to establish the premise. The whole idea is lost! Time is money, and all too often we forget to spend it wisely! If someone drops the ball and airs a spot with wrong tags, bad audio, misspellings, missing or mismatched VO, it’s the easiest way to corrupt your brand. You want to keep it in check so you don’t risk an ad being completely ineffective because the viewers now have wrong or missing information. Bad sleep, bad coffee, bad days in general—we can’t help what may affect us and cause mistakes. Whether you miss a deadline, mix up traffic instructions, put an old version of the spot out there, or forget the follow-up, it’s all a part of the process. But you don’t have to live with this aggravation. We understand the frustration of these common problems, and it is what drives our mission at Millenia 3. We are here to help you get your traffic under control because we care about your campaign success as much as you do. Think of Millenia 3 as your insurance policy for spots airing correctly—when, where and how they are supposed to. Our #1 goal is to drive tune-in and help make your show launch successful. Our team is made up of detail-oriented, hawk-eyed perfectionists, whose experience and commitment make them the most effective traffic specialists in the business. We excel at anticipating issues and solving them quickly so that you can focus on bigger things. Millenia 3 will come to you with results, not problems.